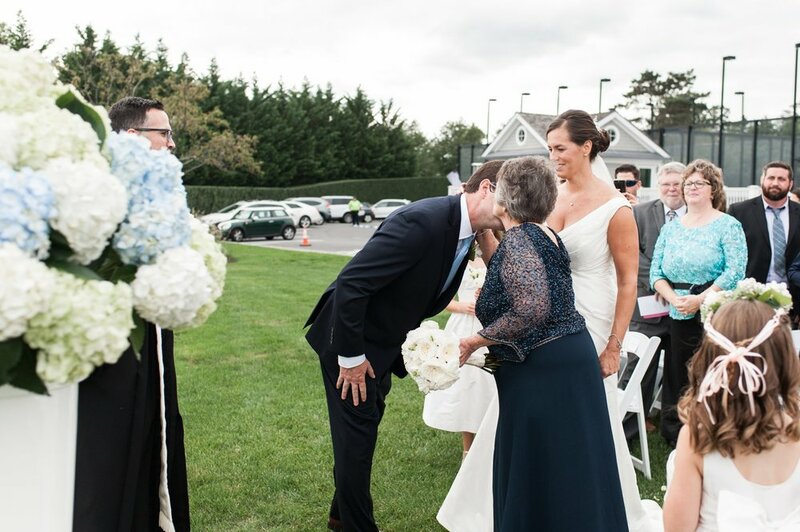 Joanne and Scott held their fall wedding at Belle Haven Club last month. They had one of those rare perfect fall days where the air is crisp but the sun shines through the clouds a bit and warms everyone up perfectly. Their wedding included so many of my favorite things because it was all about the love they share and the new family they were becoming. It was an intimate affair with 75 family members and close friends in attendance. 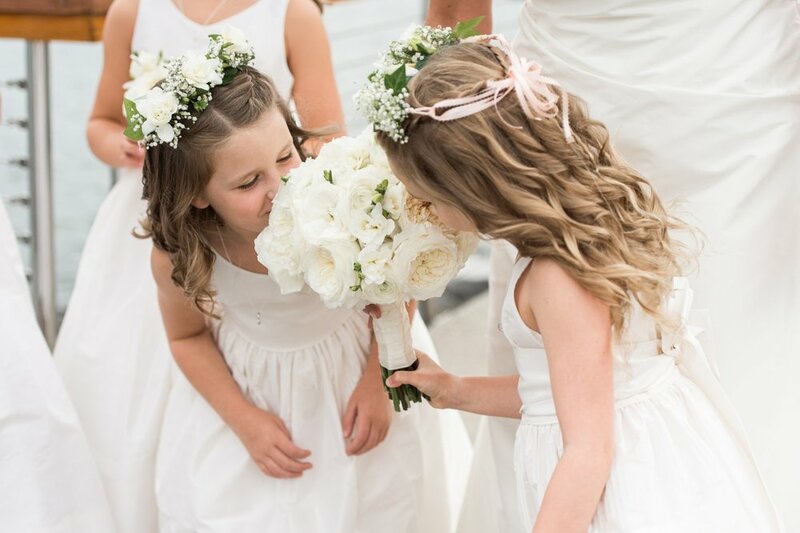 There was no bridal except for Scott’s three daughters and Joanne’s niece, ages 6-10, who served as flower girls in the perfect cream dresses with bows, flower crowns, and sparkly shoes. Scott and Joanne gave each of them a silver heart necklace to wear on the day. 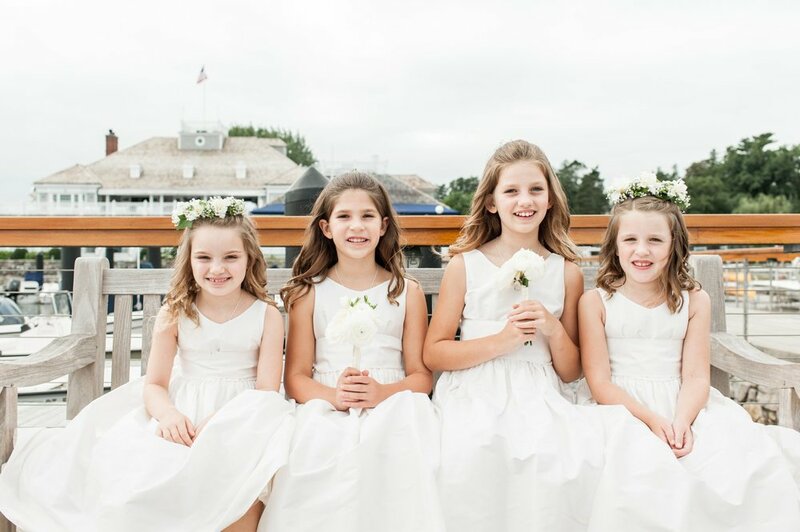 They were vibrant, silly, and happy little girls and they made for the sweetest little bridal party you’ve ever seen. 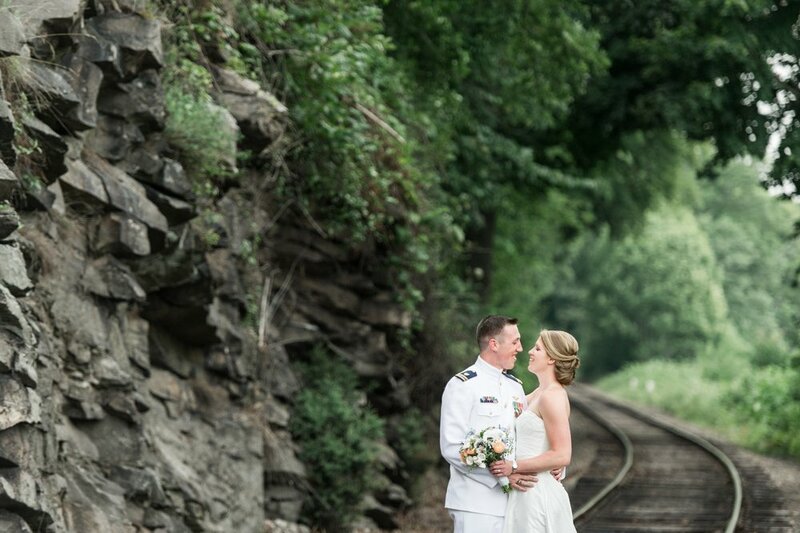 Scott’s oldest in particular was so attentive to Joanne – she carried her train in between photos and after the ceremony to ensure it didn’t get dirty. Joanne’s father passed away a couple years ago and it was important to honor him and feel him near her throughout the day. So she wore a charm bracelet that he gave her in remembrance. He was a pilot and each of the three plane charms on the bracelet represented planes he flew during his career. I love that she decided to wear it and keep him close in that way throughout the day. 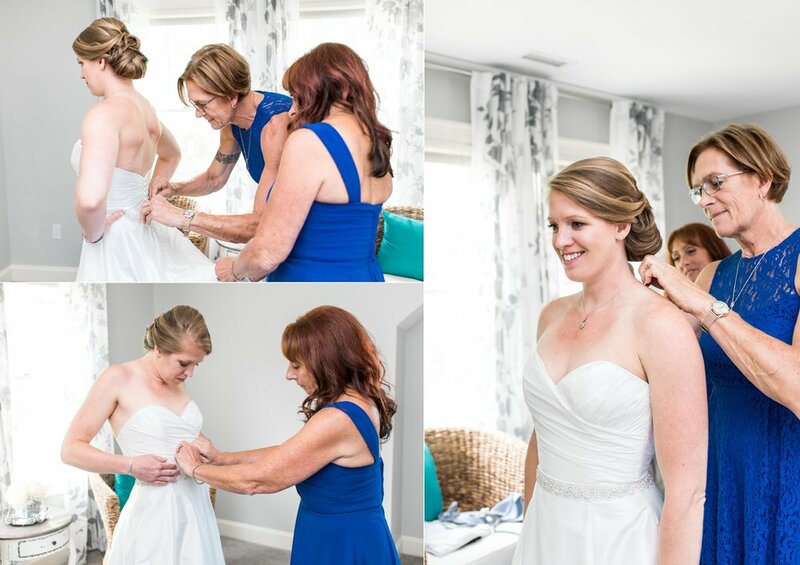 Joannes and the ladies had their hair and makeup done by Beauty Entourage and then her mom and sister-in-law helped her get into her Augusta Jones dress that she got from Kleinfelds. They each took turns almost crying and valiantly holding back happy tears to avoid smearing their makeup! Joanne then had help from the flower girls in putting her shoes on before heading out to see Scott. 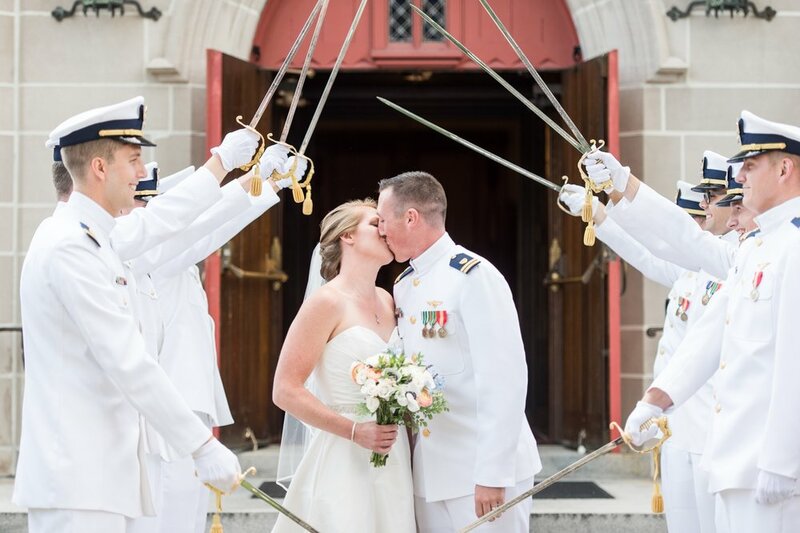 Joanne and Scott opted for a first look so that they could spend every second of their cocktail hour with their guests. 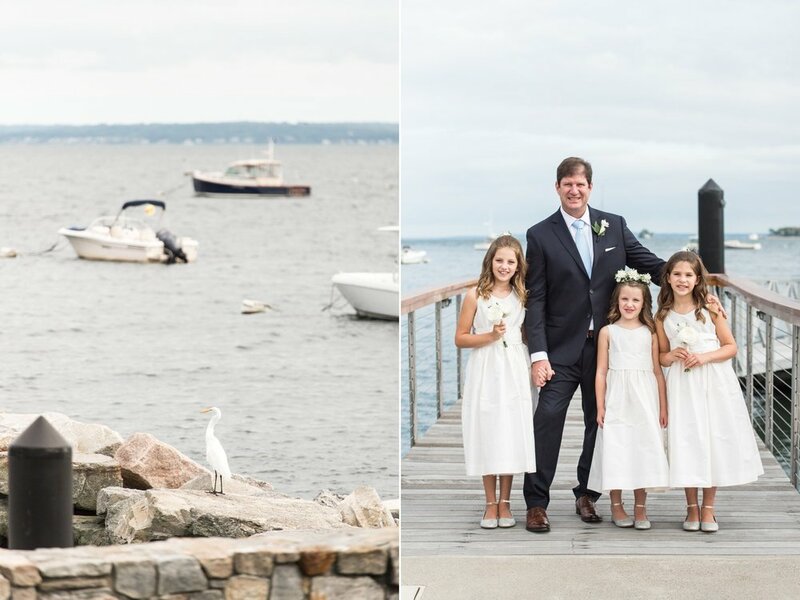 Joanne loved that Belle Haven is right on the water, so we did their first look and formal portraits with the girls down on the docks. She and Scott both instantly relaxed and cracked huge grins when they saw each other for the first time. They hugged each other and kissed each other and drank each other in. And then we brought the girls down for portraits as well. 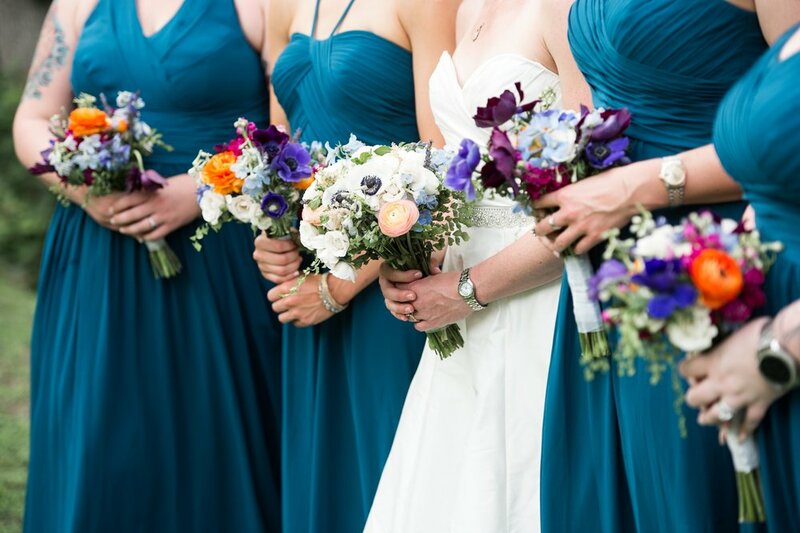 Joanne and the girls carried simple and elegant bouquets by Green of Greenwich. 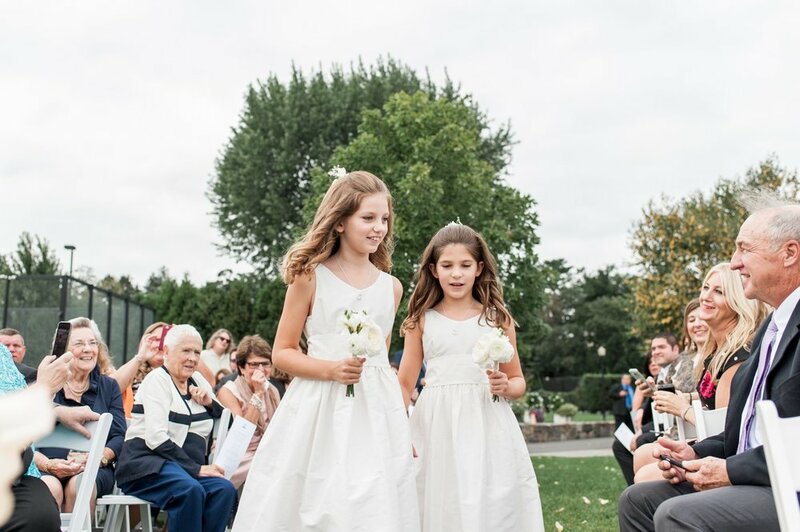 The ceremony was lovely with the flower girls walking in pairs down the aisle before Joanne was escorted by her Mom. 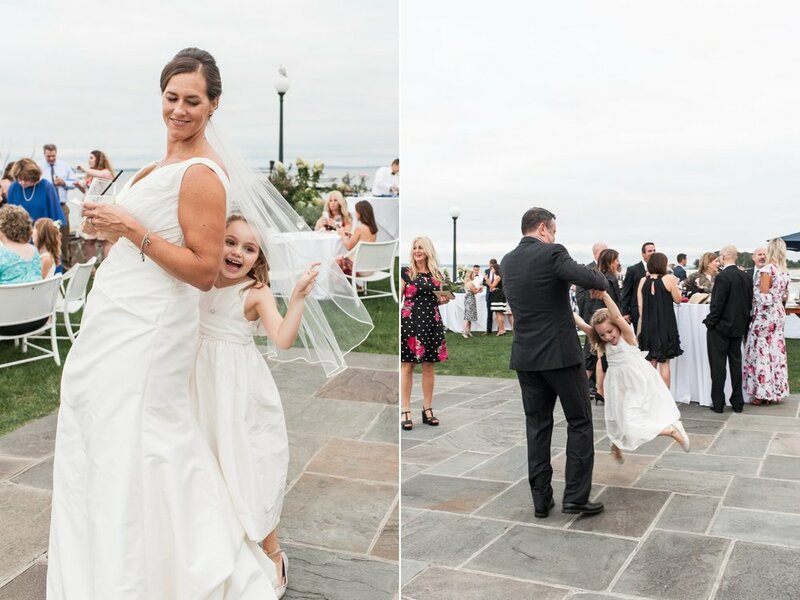 Joanne was so excited as she held onto her mom’s arm that a huge grin came across her face as she waved to all of the guests on her way to marry Scott. 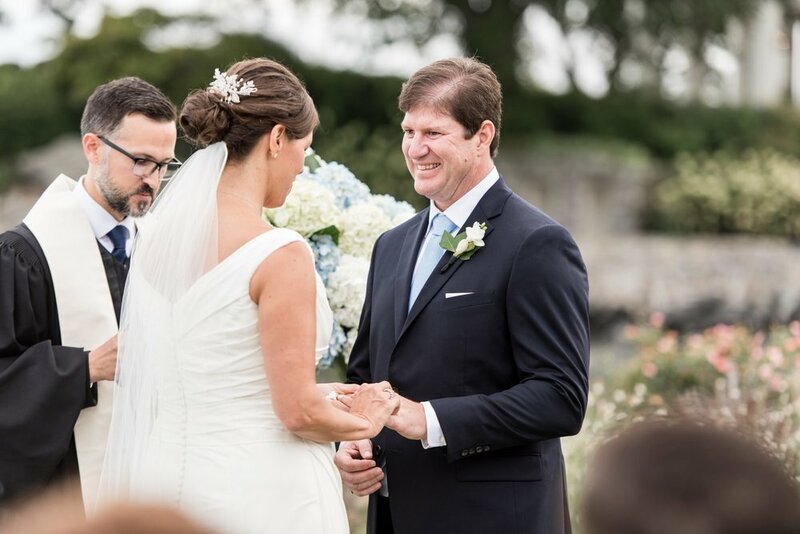 Like the rest of the day, the ceremony was full of moments of laughter, smiles, and Joanne and Scott catching each other’s eyes often. Oh, and the view was pretty spectacular too! 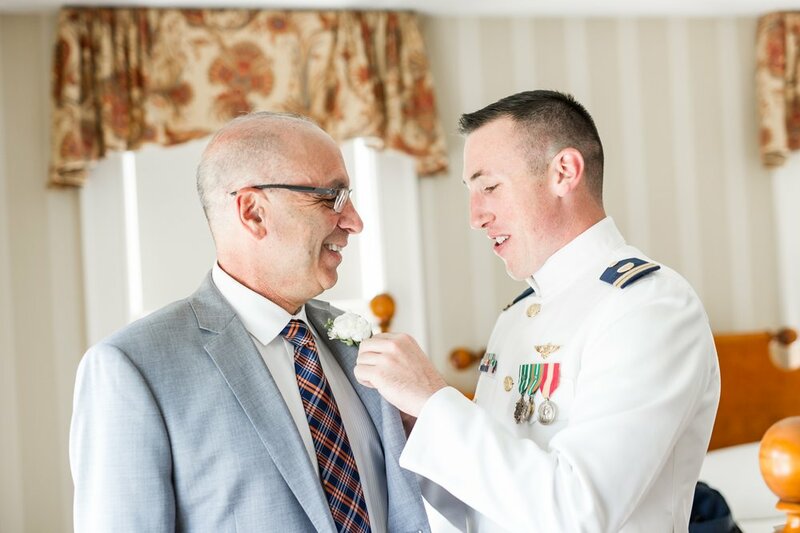 Wedding days always fly by, so I love that they went for the first look and savored every moment with each other and their friends and family. Their cocktail hour was outside on the patio right next to the water. They had a jazz duo playing music throughout the hour and they noshed on all the amazing apps passed before dinner. 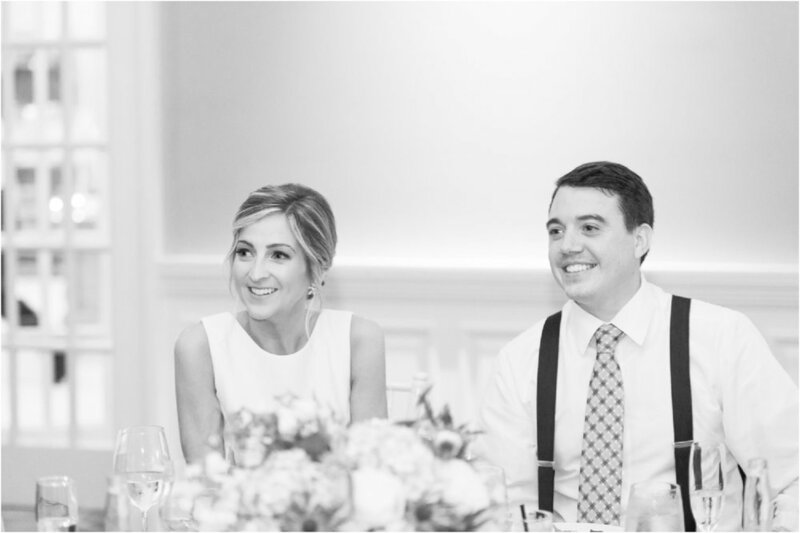 It was laid back and relaxed and so fun to see both of them get excited every time one of their guests came up to congratulate them for the first time. Joanne was so thoughtful about every detail. 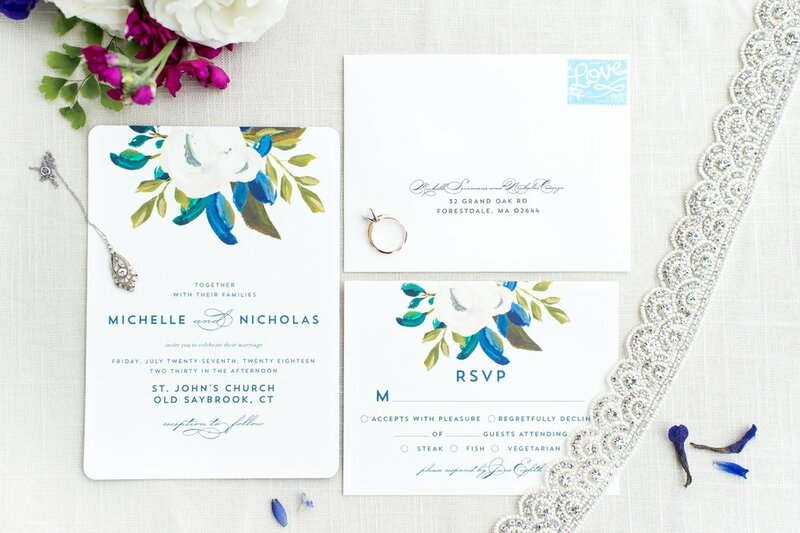 She had a monogram that incorporated a nautical knot designed and it was placed on the invitations by Social Alchemy, the menus, the favors, and the cake by Black Forest Pastry Shop. 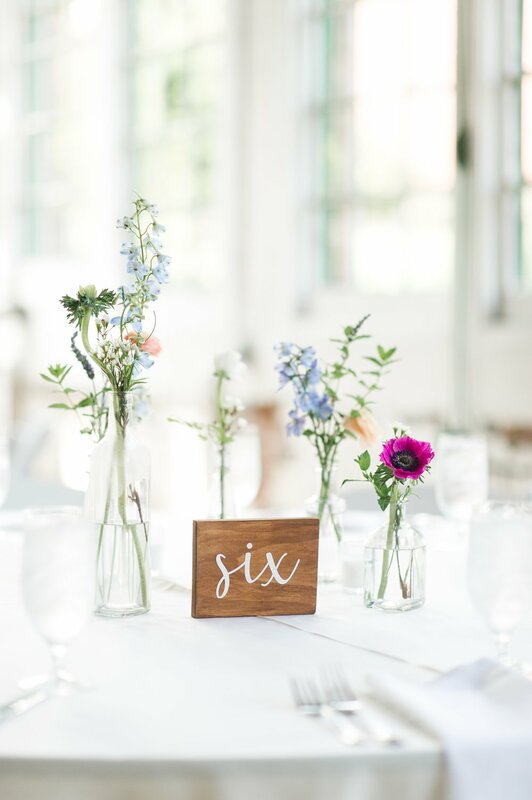 The floral centerpieces were lovely and the whole room glowed with the bistro lights she had strung across the ceiling to add intimacy and warmth to the room. 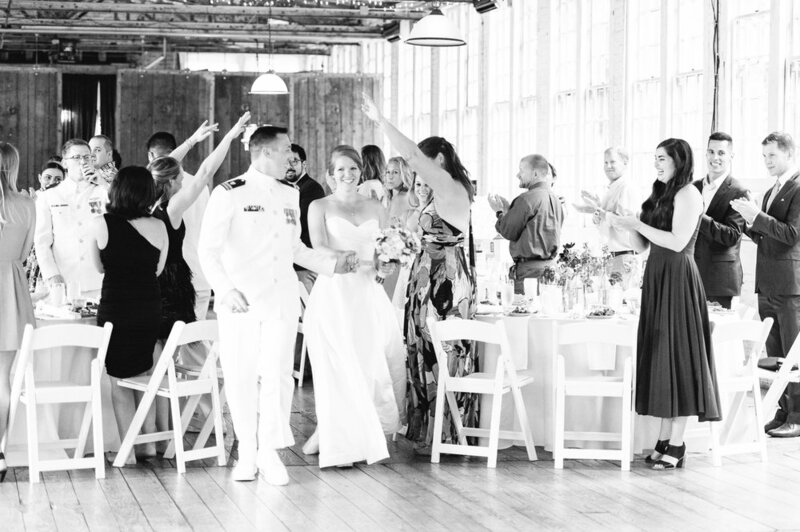 Dinner and dancing took place upstairs at Belle Haven and the night allowed for all the doors to stay wide open, welcoming in a breeze and letting guests flow out onto the patio to relax and chat or dance inside to the music provided by the amazing band. And let me tell you – Joanne has some serious dance moves! She was busting a move for most of the evening on the dance floor! At the end of the night, they guests lingered on the patio as they didn’t want to celebration to end. The newlyweds exited in style, waving goodbye to their guests as they snuggled up together on a boat that whisked them off into the night. How’s that for a magical ending to a perfect day?! 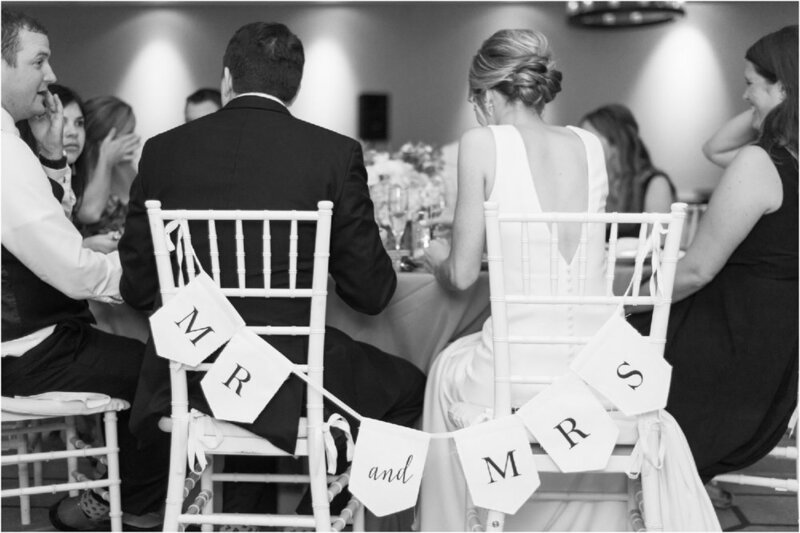 Michelle & Nick's Lace Factory Wedding took place on warm and sunny summer day at the end of July. These two are both active service in the Coast Guard and they met and became best friends during Flight School. They were then stationed at two different aviation units with Nick in Detroit and Michelle on Cape Cod. It was their time apart that solidified how much they really cared for each other and they started dating, even though they knew they'd spend their first four years apart at separate assignments. They have one year left to go before reassignment, and now they'll apply as a married couple for an assignment on the same base! They often try to surprise each other and make their time together special because they spend so much of it apart these days. So Michelle completely believed Nick when he said they were getting up early to go apple picking. Instead, Nick surprised her by proposing on a sunrise hot air balloon ride when he was out to visit her one weekend! 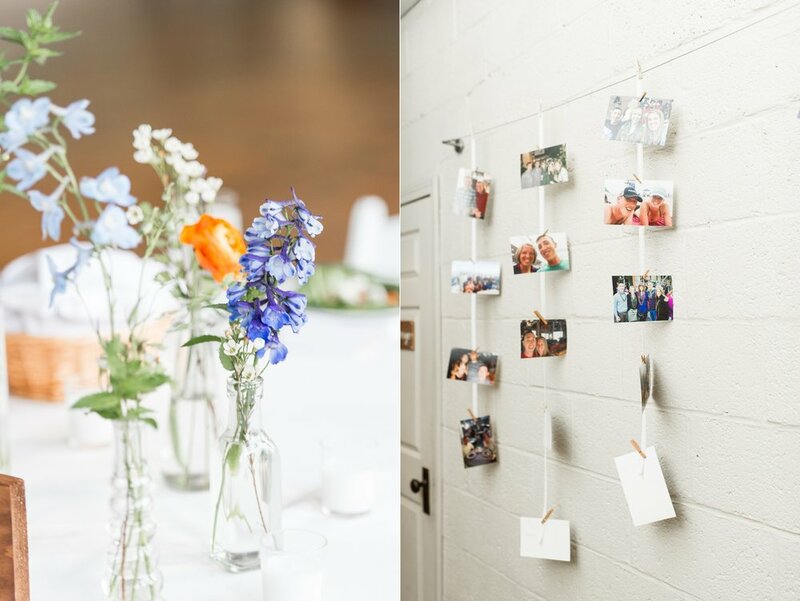 They loved the laid back elegance of the Lace Factory and wanted to make sure their loved ones had the best possible time. 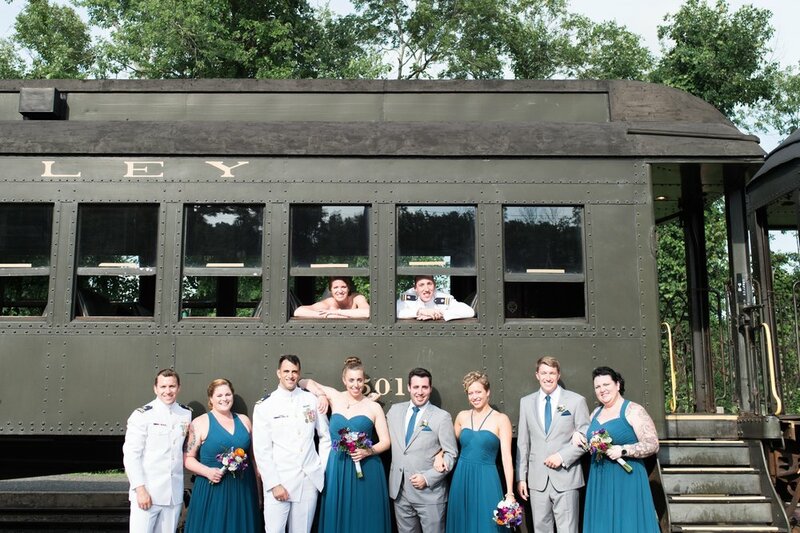 So they made a point of including corn hole for their guests to enjoy and surprised their guests with transportation to the reception via the Essex Steam Train. 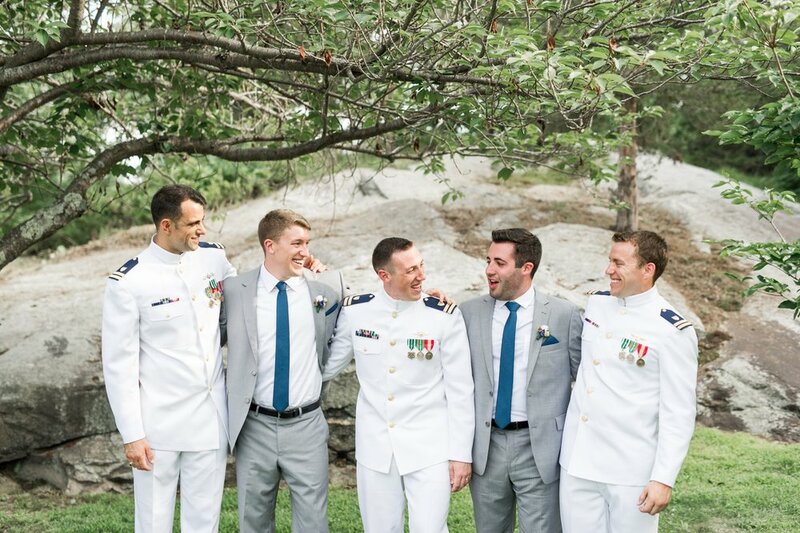 Nick and the groomsmen got ready at the Griswold Inn in Essex while Michelle and the ladies went to Essence in the morning to get their hair and makeup done before Michelle got into her Modern Trousseau dress and doing finishing touches at Nick's parents' home. 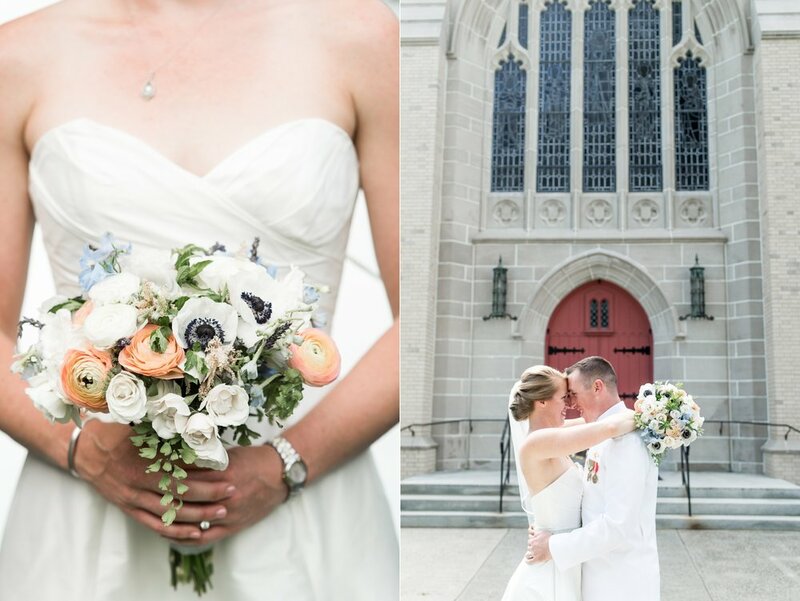 Michelle had her gorgeous florals from Ashleigh's Garden delivered to the house and that meant a chance to o some bridal portraits and bridal details that incorporated the flowers. Michelle's beaded purse was handmade for her and she wore her great grandmother's necklace for the day. These two truly special heirloom pieces made the day even more special. She also opened a thoughtful note and gift from Nick before we headed to the church! 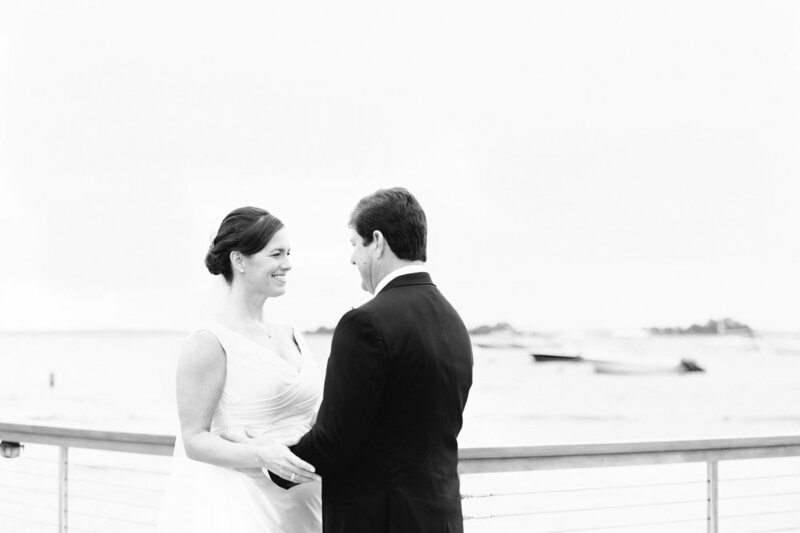 Michelle and Nick had a lovely church ceremony in Old Saybrook. They were constantly smiling and seeking each other's eyes. The ceremony was beautiful and touching and full of smiles. 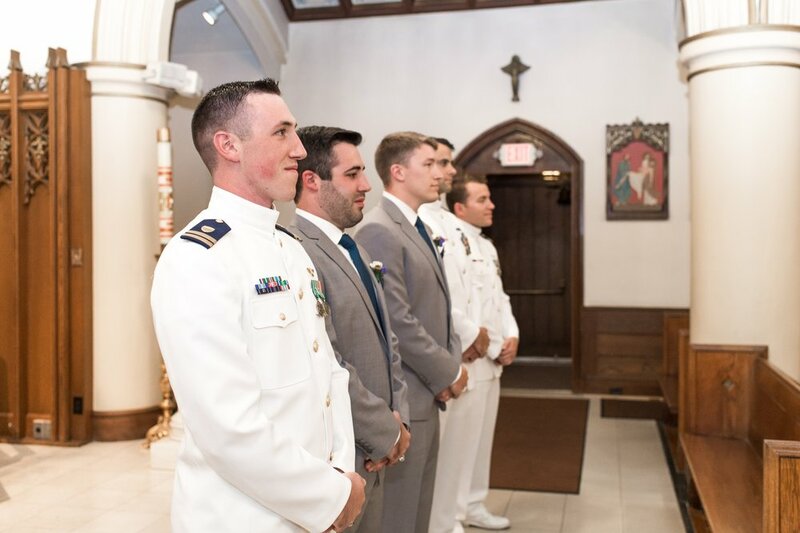 On the way out of the church their friends in the Coast Guard, all wearing their dress whites like Nick, gave them a proper exit with a sword arch! 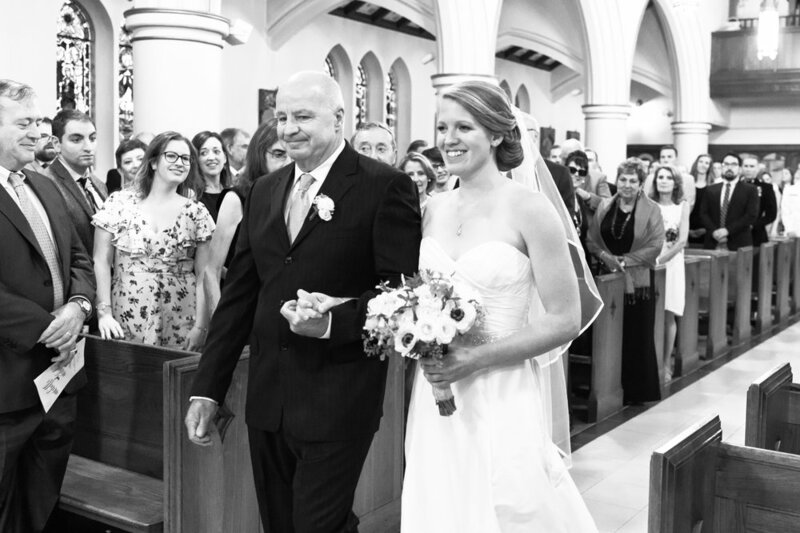 They are some of my favorite recessional photos of all time! 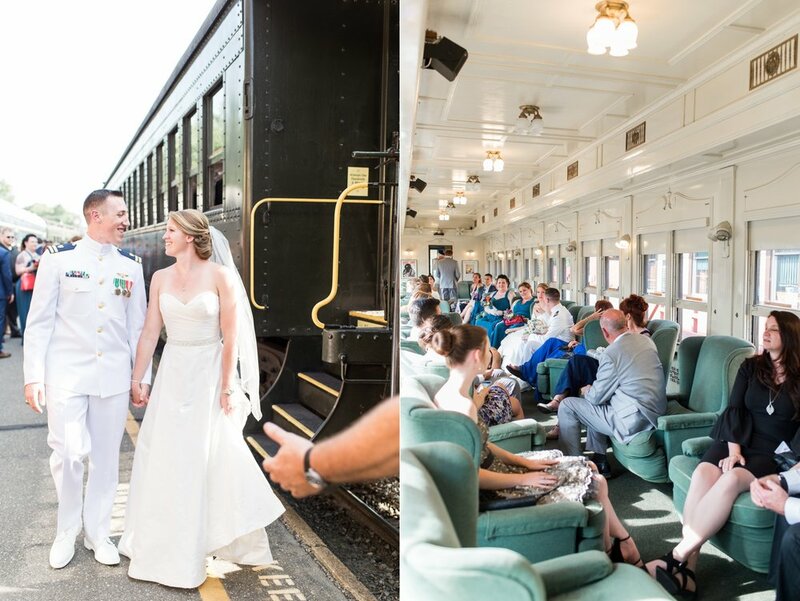 After the ceremony bride and groom and guests headed to the Essex Steam Train to catch a ride to the reception. Before boarding we found some shade in the train yard and took their family portraits. 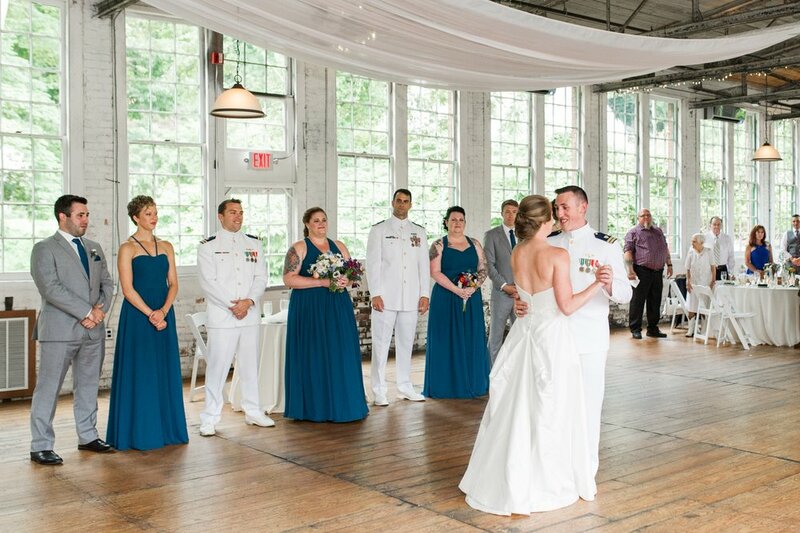 After arriving at The Lace Factory, the bridal party joined the bride and groom for formal portraits before they skipped off to cocktail hour. Then Michelle & Nick snuggled up for couple's portraits together on and around the tracks and grounds of the Lace Factory. The grounds are beautiful and you don't have to go far to find a plethora of different gorgeous spots to take portraits in. These two were so genuinely overjoyed to be together and getting married that the smiles were seriously plastered to their faces all day long. So needless to say, portraits were a ton of fun and super adorable! 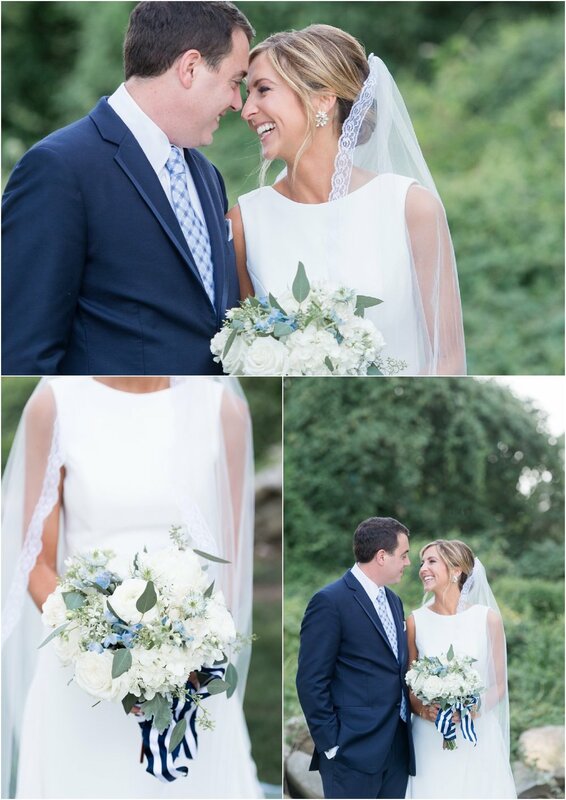 Lindsay and Travis had a gorgeous summer wedding at The Patterson Club in Fairfield, CT. The sun was shining and the sunset was gorgeous. 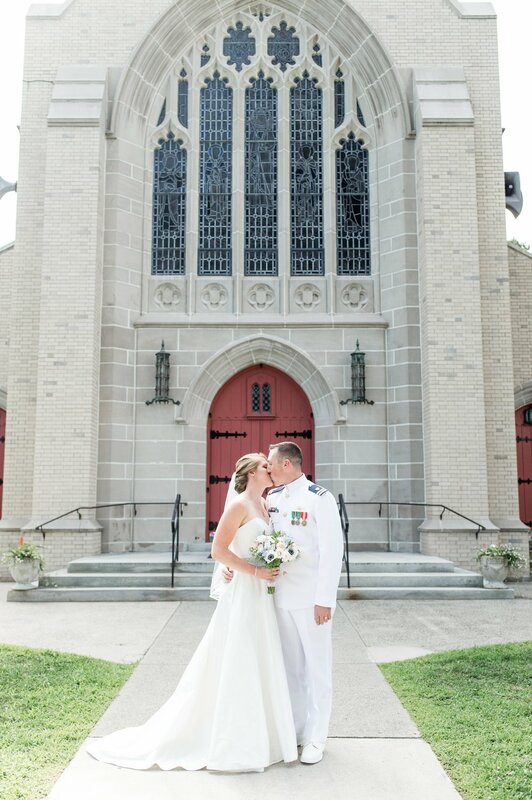 They said their vows in a church service and then we went to the Patterson Club for their portraits. 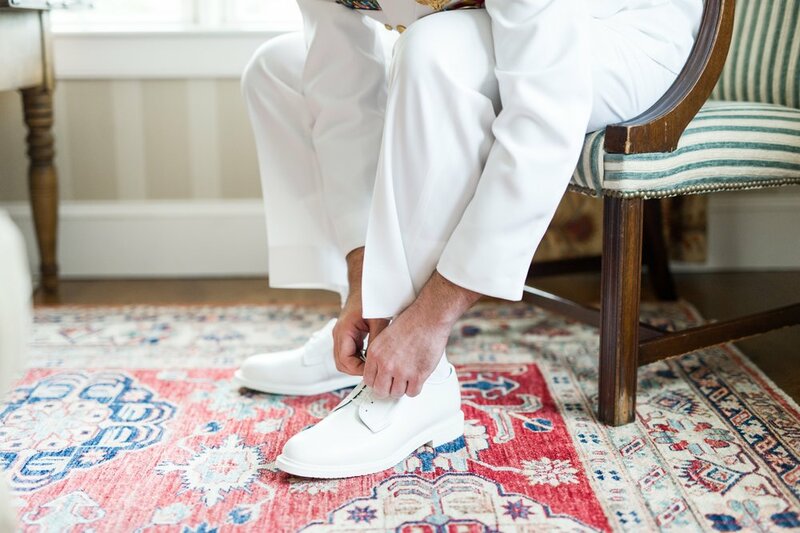 Their bridal party wore navy and their were subtle elements of nautical and preppy inspiration throughout the day. 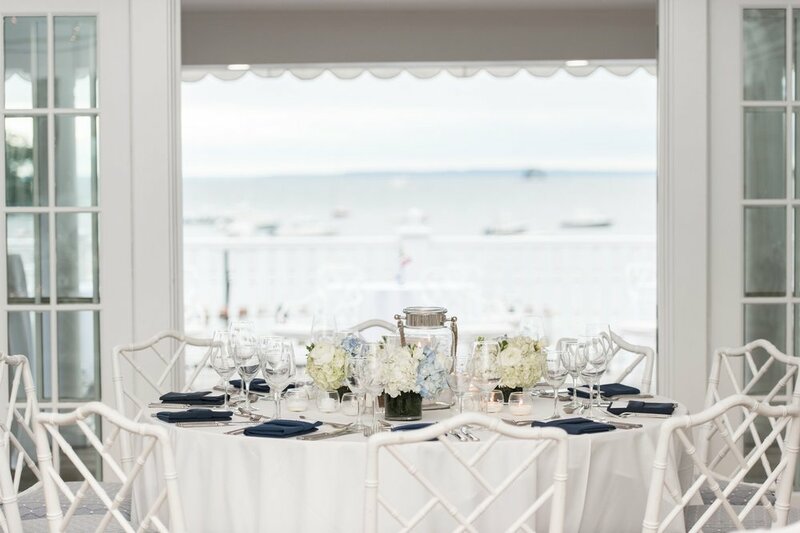 The bouquets were wrapped in navy and white striped ribbon, the centerpieces included beautiful hydrangeas, and the club was the prefect backdrop for both natural surrounding and a classic New England look. 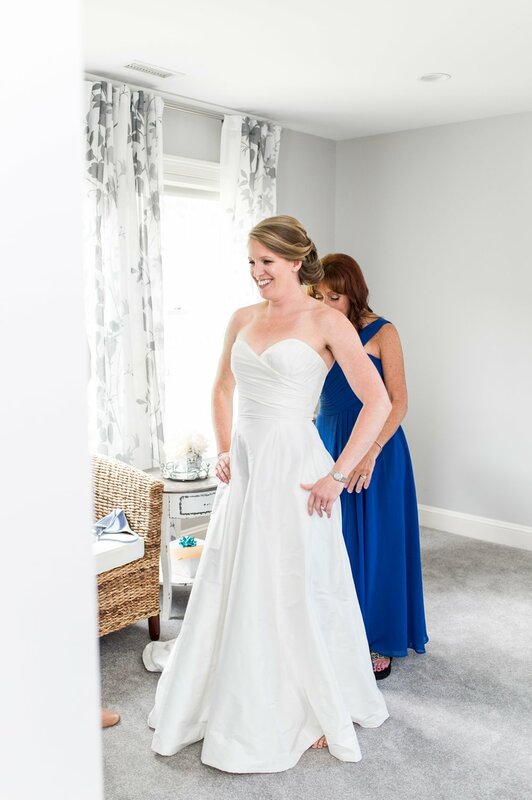 Lindsay got ready at the Delamar Hotel in Southport in a sunny suite with lots of room for all of the ladies to get ready in. 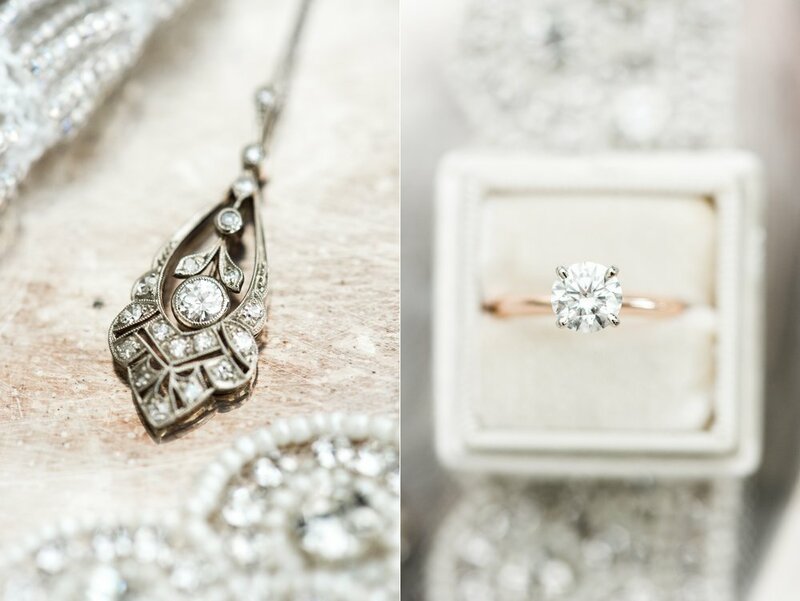 I just loved her simply classic bridal look, with a touch of bling in her delicate jewelry. She was such an elegant and beautiful bride! 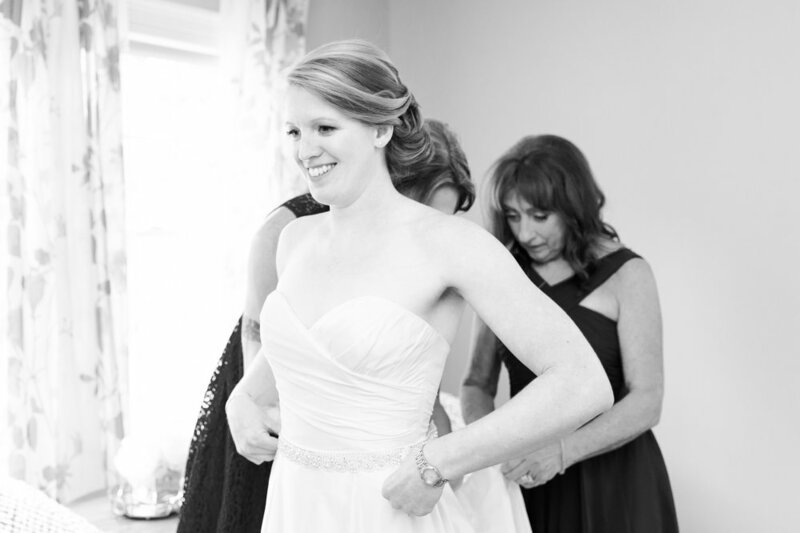 And she had her sister and sister-in-law help her put on her dress and finishing touches before doing a reveal to the rest of her bridal party and her dad. 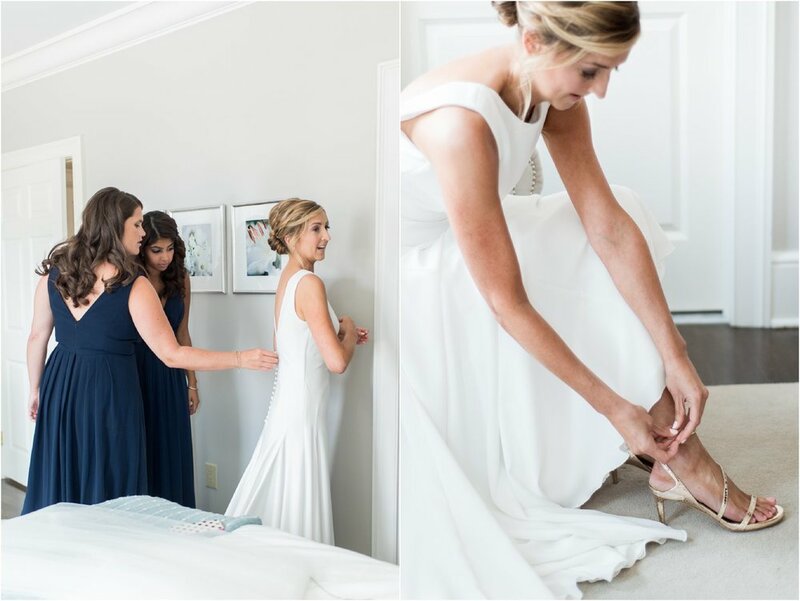 It was a perfect way to keep the moments of getting ready moments intimate and full of a quiet anticipation, while also making her sure all of her bridesmaids felt included. 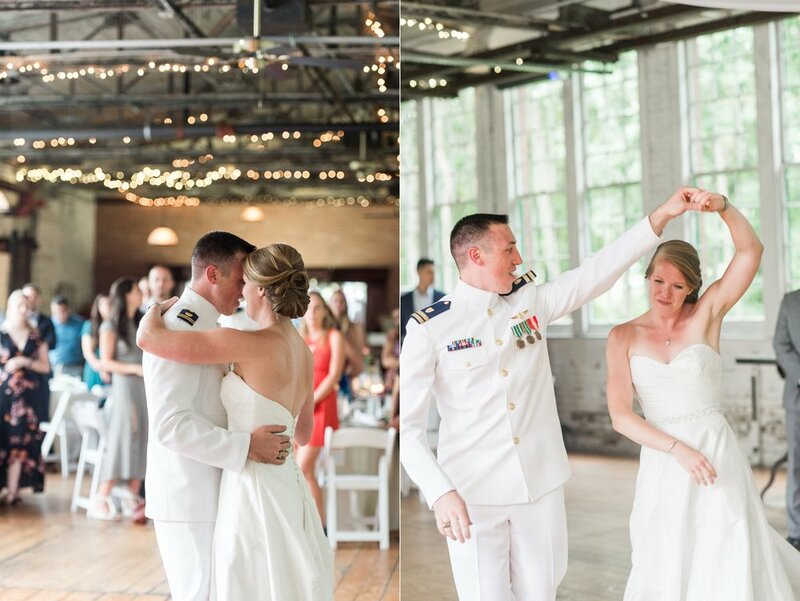 Lindsay and Travis didn't see each other until she was walking down the aisle toward him in the church. The way they looked at each other and couldn't help but smile throughout the entire service was a perfect indicator of how very much in love these two are. And their friends and family clapped and cheered as they walked back out of the church as Mr & Mrs! We had a nice cushion of a couple hours between the church service and the start of cocktail hour to take their portraits since they did not do a first look and we went straight to the Patterson Club to take advantage of the beautifully curated grounds. I loved the nook we found just a short walk from their reception ballroom. It had light glimmering through the trees, a stone wall and a mixture of curated lawn and overgrown brush that made for a perfect backdrop. 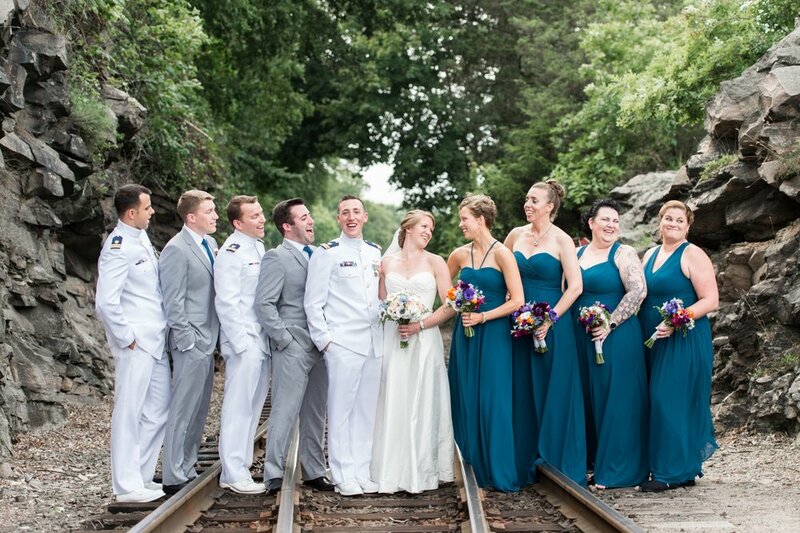 And the wedding party were all so sweet and so much fun - they made photos a breeze - even with such a big group! 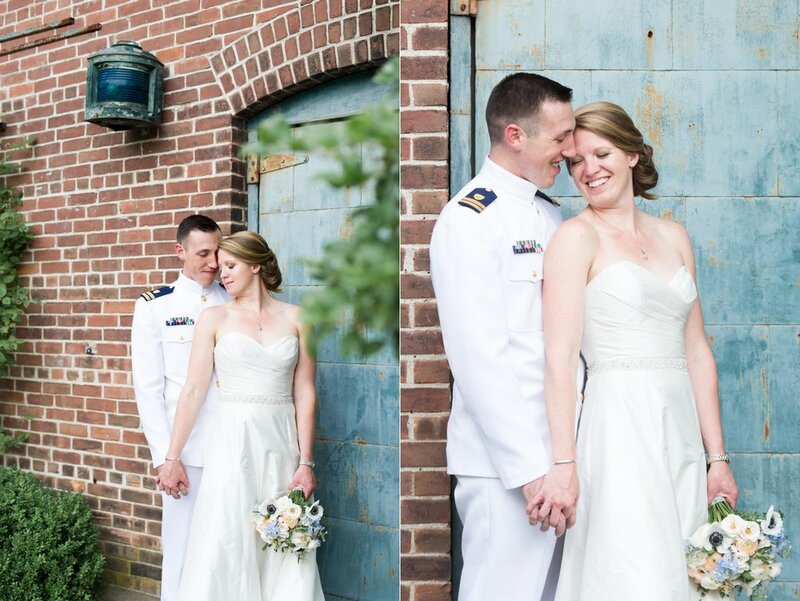 We sent them back inside while we took couples portraits of Lindsay and Travis so they could get close and snuggle together without a crowd looking on. Then we took family photos on the patio of the club - a perfect spot to get great light and also escape the afternoon heat! The evening flew by as everyone danced and toasted to the couple. And their thoughtful details made the cocktail hour and reception extra fun.